Herbs traditionally used to cleanse, nourish, moisten and revitalise the skin, improving its texture and tone. In traditional Chinese medicine (TCM), these types of dermatological issues are often seen as being caused by an energetic imbalance in which there is too much Dampness in the body, often accompanied by excess Wind and/or Heat. 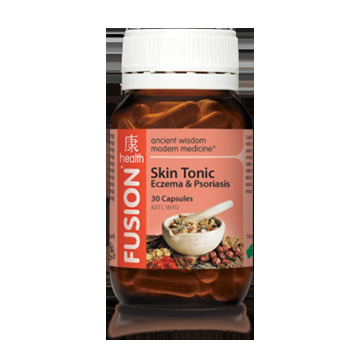 Fusion Health is an Australian owned company who make health products partially or wholly based on the principles of Traditional Chinese Medicine. Their products represent the ancient wisdom of Chinese herbal medicine, transformed by modern methods of extraction and dose delivery. Their products are manufactured in Sydney. A specially formulated blend of Chinese and Western herbs traditionally used to address skin conditions and promote a healthy complexion. Improves the texture and tone of the skin, and helps reduce dryness, redness, thickening, scaling and cracking. Suitable for use in a wide variety of dry, itchy, inflamed and/or scaly skin conditions, including eczema (dry or weeping), dermatitis, psoriasis, hives (urticaria) and non-specific rashes. Strengthens the skin’s natural resistance to minor infections, and helps clear mild-to-moderate acne and minor boils. Promotes healing of scratches, cuts, abrasions and other minor wounds and sores. Suitable for men, women and children 6 years and over. Combines well with Fusion® Dermaheal cream, which helps relieve itchy skin conditions and promote healing. For nutritional support of problem skin, combine Skin Tonic with Fusion® Zinc Advanced, which may assist in the management of dermatitis, eczema and mild-to-moderate acne or Fusion® Hair, Skin & Nails, which provides nutrients that help maintain a healthy complexion and support skin repair and healing. For allergic skin conditions such as eczema, dermatitis or hives, consider taking Fusion® Allergy in addition to Skin Tonic. Use under the supervision of a healthcare professional. If symptoms persist consult your healthcare practitioner.